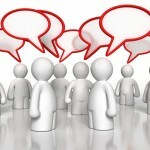 Home » discipleship » What are some of the benefits of discussions? What are some of the benefits of discussions? What are some of the benefits of discussions? So, that may sound like a weird question. Some of my readers have determined that discussions are not as beneficial to the church as sermons. So, those readers might immediately respond, “There are NO benefits to discussions.” Well, I don’t think that’s true (even if I believe that there are benefits to sermons). Still other readers are on the fence about discussions and/or sermons. So, why am I asking this question? A few weeks ago, I was have a conversation with a friend about discussions and sermons. And, I realized that I had never written specifically about the benefits of each method of teaching. Here’s a quick definition: More than one person teaching about a topic or passage from Scripture. Now, I know that everyone has experiences with good discussions and bad discussions. I’m not interested in that in this post. In this post, I’m asking for you feedback on this question: What are some of the benefits of discussions? You may want to throw out your reasons for disliking discussions. Please don’t. That’s not the purpose of this post. You may want to tell me all the benefits of the sermon. Please don’t. That’s not the purpose of this post. There may be benefits that are common to any kind of teaching or speaking. That’s fine. If it’s a benefit of discussions, then please share it. So, what are some of the benefits of discussions? What are some of the benefits of sermons? Opportunity to clarify points made. Able to be tailored to the audience rather than generically appropriate. Enable opportunity to challenge assumptions/material being presented. Encourage participation, involvement and a sense of belonging. Provide opportunities for other gifted teachers and leaders to be identified, encouraged and acknowledged. 1. When I verbalize thoughts it is very helpful in shaping my beliefs. For instance, sometimes a question is posed and in my head I know the correct answer but I still have my own questions/concerns. When I am enabled to flush out my thoughts verbally and receive input from multiple members of the body it is incredibly helpful in solidifying what I believe. One of the primary benefits to this for me is that it strengthens my faith, meaning I am able to give a defense for what I believe on my own. For many years I was intimidated by the idea of sharing my faith and in hindsight it was because I hadn’t properly tested my foundation. 2. I see the power of the Holy Spirit at work when ordinary believers speak the heart of God. It affirms that God’s spirit does reside in each of us, and that He loves us so much (no member more than another) that He would have another body member speak His truth to me and vice versa. Discussions involve relationship, which gives people the opportunity to practice listening, thinking, rethinking, enter into another’s world (empathsize) and be present for others. Discussions promote the messiness of relationships…a good thing to assess a life lived in and by His grace. Life giving discussions require humility. A discussion is just all about an intellectual learniing. I often ask people to try to remember conversations/discussions in which they have particpated as opposed to sermons to which they have been passive listeners. Invariably people recall the discussions much more readily and retain them far more effectively! I believe that is why the Lord Jesus and His disciples invariably taught believing disciples via conversations! Discussions allow two-way communication and seem to require fewer people to be successful. Good discussions have the benefit of a good leader who allows people to SLIGHTLY wander while keeping a leash to bring the discussion back to the topic. An unleashed discussion can be dominated by a few individuals and keep others from participating. It is necessary to establish a safe environment to get full participation. #1. It honors everyone in the room – their revelation/insight/observation/opinion is valuable and needed and highly desired !!! #2. It allows you multiple views of a multi-faceted God. You can start seeing Jesus in 3D instead of your own 1 dimensional view. #3. It enables you entrance to one another’s hearts where prayer, and help becomes practical and impassioned. #4. It opens the door for all of the ‘one another’ing found in scripture. #6. It gives immediate feedback on just where another person is as far as maturity, discernment, purity, forgiveness, understanding, etc. This makes ministry targeted and effective as opposed to shooting randomly in the darkness. Actually – the absence of discussion is tyranny. The church has majored in tyranny for decades. Interaction and engagement. Corporate involvement. Learning from others. This researcher studied groups working together for a long term project/purpose…. and the researcher intentionally chose one person in SOME of the groups to play “devil’s advocate”…. give push back, ask questions, give disagreeing views or opposing or different perspectives. after the first ‘goal’ was accomplished… they took tests & assessments. In the groups that had the devil’s advocate…. they individually knew more about each other & the project than the other groups. The quality of their work together was greater…. their understanding on the subject they were researching together, greater. But interestingly enough!! after the first round of assessments of the group….without seeing results…. each group got to “vote out” one member of their team for the 2nd round…. and every.single.group that had the devil’s advocate – picked that person to be the one to leave! the very thing that was making them stronger, know more about each other & the subject, think deeper, be stronger in their convictions, bond more, learn more & have an advantage – they got rid of. because it was harder? MORE TIME? more effort? more work? uncomfortable? they saw failure instead of success for whatever reason? I don’t know what this has to do with anything…. but I do know that the groups that had more and more chances to learn how to handle disagreements & communicate through hard things & talk things out and still stay together until completion…. were the most successful & impactful groups. we do not know HOW to disagree intellectually. so we have disunity – emotionally, relationally, spiritually. BUT of COURSE COURSE COURSE we would never want to have an ARGUMENTATIVE person in a group!!! so if they seemed argumentative, i’d kick them out too! 🙂 but FREEDOM to come with our differences & honest thoughts…. that’s what we should want! I agree with the fact that most Christ followers do not do conflict and confrontation well, believing that these two things are generally bad. In reality, if we learn how to do conflict and view it as inevitable in relationships with others, we ultimately grow in receiving the love of Christ and offering love to others. Do we need a “devil’s advocate” in the group to grow? No, we need to know how to resolve conflict for the sake of the relationship, trust Christ, live deeply in His grace and love as He loves us. Go to: http://www.emotionallyhealthy.org and the great work Pete and Geri Scazzero are doing to take all of us deeper into loving well in the family of God. Of course it isn’t a totally accurate example to the body of Christ. This study we read was in my husband’s textbook at a secular school for his MBA. But the parallel to what happens within the Church was too good to not post. My point was that we don’t know how to disagree. We need to. 😉 Nobody taught us how and even from a young age we are taught differing views & questions are something to avoid. 🙂 Thanks for the comment. As far as your recommendations on this ministry & their books. I did buy the book, The Emotionally Healthy Woman after your recommendation the last time…. and I enjoyed it but I did have major concerns with the incompleteness of it. I enjoyed many of the chapters encouraging truth conversations & knowing our own boundaries & personalities….. however, the book was incomplete because it forgot to wave the banner of Christ that the truth is we ARE called to sacrifice. We ARE called to love & lay down our lives & give beyond what we think we are capable….. and I am saddened by how the call and flag was never raised. The truth is that when we follow Christ — as we practice more and more genuine love – we will be able to love harder, better, longer….. Church in the Circle (drawing a blank on her name) reminded me of that many times as well as Alan. We can’t forget the call to progress in love. Anyway!! 🙂 Just wanted to share that. to be aware of the concerns & situations that people are actually going through so you can address & lead them through that. To know the “hangups” people are having will help us actually make applicable our teaching…… so that you are actually teaching, helping them what is important & applicable for them to be hearing/learning…. not just what YOU think they should be learning. I read through some of these comments, though not all so this could be redundant. In our most recent house meetings we explored several topics that involved misinterpretation that has followed us through a good portion of our lives. It was fascinating. One was the scripture about how David danced “naked” before the Lord. Wow, is there a lot more to that than just the literal. As there were several children in the mix, it was rewarding to know that they will benefit from discussion around that portion of Scripture. Most of us adults had to admit that we had other similar misconceptions from early perceptions that went unchallenged. Alan are you still blogging on this site? I’ve not seen anything since 2013, but I’m imagining you’re busy with your Ph.D.? Hope all is well. I use discussion almost exclusively as a bible teacher. I have found over the last 14 or so years, especially lately, most church goers are pretty well set in their “theological” ways and for the most part know what they believe. Discussion seems to make that happen best. Usually discussion will indicate where people stand on a position and the discussion can be used to shape the lesson and move us in the right direction. Plus, you often times have people of different life experiences and their discussion points can add to and enrich the discussion. I have always seen my goal in teaching was to help people believe the right things about scripture. I’ve found discussion gets otherwise busy people to stop and think deeply about the topic. It is usually discussion that helps clear up misconceptions and misunderstandings and brings unity (where possible) to group discussion. Most of all, people enjoy the involvement.